The Bay Area joined in the national day of mourning, 13 years after two planes slammed into the twin towers and the Pentagon killing nearly 3,000 people on Sept. 11, 2001. In San Jose, Fire Station No. 1 held a small ceremony in the wee hours of Thursday morning, where fire crews rang a bell and put out wreaths to mark the terrorist attacks. The Fremont Fire Department unveiled a new 9/11 Memorial, made with some steel from the World Trade Towers. 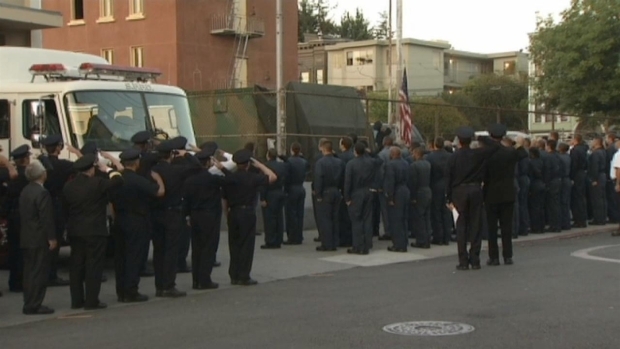 In San Francisco, firefighters held a ceremony at Station No. 7. "We are eternally grateful for the work you've done and continue to do," San Francisco Mayor Ed Lee said at the somber ceremony. San Francisco firefighters and Mayor Ed Lee mark the 13th anniversary of Sept. 11 at Station No. 7. Of those who died, there were about 400 New York City firefighters, paramedics, police and Port Authority workers who died that day. And the anniversary has become a time to thank the nation's first responders who protect and serve the public on a regular basis. The Flight 93 Memorial in Union City honors those who died aboard the United flight that went down in Shanksville, Pennsylvania. In Union City, Michael L. Emerson, a retired Marine and founder of the American Veterans Hayward Post 911, hosted an annual Flight 93 memorial at 10 a.m. to honor those who died on that United flight that crashed over Shanksville, Pennsylvania. The flight carried some of the well-known heroes of that day. VideoFirefighter's Tribute: "On Sept. 11, This Is My Home"
Two of those heroes hailed from the Bay Area: Tom Burnett, a CEO of a medical devices company who lived in San Ramon and Mark Bingham, a PR executive who lives in Los Gatos. Those two, along with Jeremy Click and Todd Beamer, are credited for trying to fend off the terrorists before their plane went down. Beamer is the one heard on the plane's black box recorder uttering the now-famous words "Let's Roll," before hatching a plan to storm the cockpit and take over the plane. 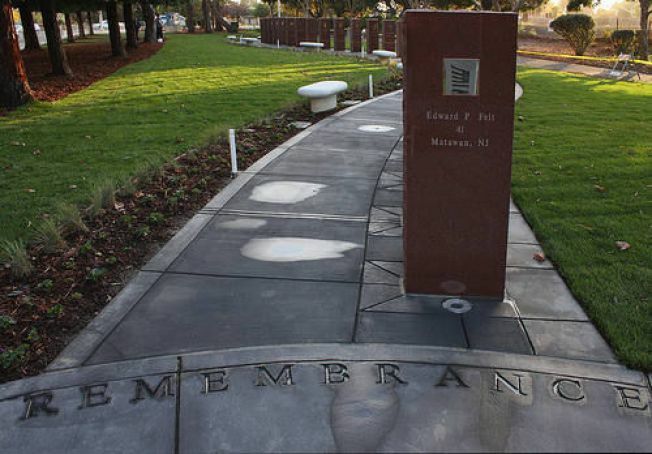 The memorial, however remembers everyone on board that day with a "remembrance stone" exemplifying, Emerson said, the fact that "each person was more than just a moment in history, or a victim linked to such a horrifying event. 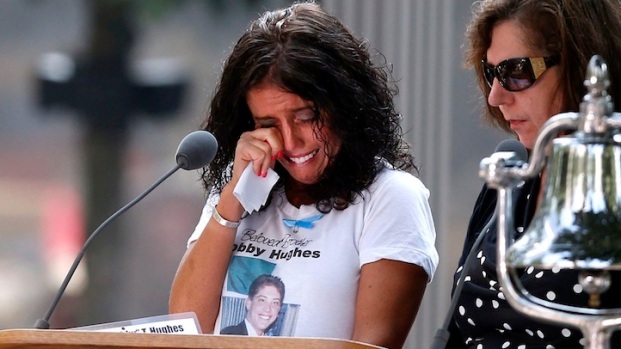 The memorial has put a face to each soul lost on that fateful flight." A new 9/11 memorial is set to be constructed in downtown Hayward, not far from a memorial built in neighboring Union City. Nannette Miranda reports. 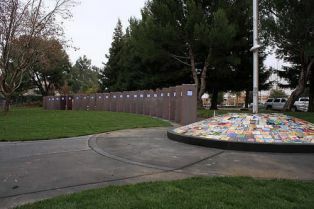 And in Hayward, Emerson is spearheading efforts to build a new 9/11 memorial on the corner of Mission Boulevard and D Street, not far from the memorial in neighboring Union City. Emerson originally wanted Hayward to house the memorial in 2001, but city leaders at the time did not move forward with the plan. But with new leadership at the helm, Emerson said 75 percent of the funding has already been collected from private donors to build the new memorial. "This hit us just as hard in California," Hayward Mayor Barbara Halliday said. "It may not have been quite the same, but I know it was a very hard time, and we all mourned for those who were lost." 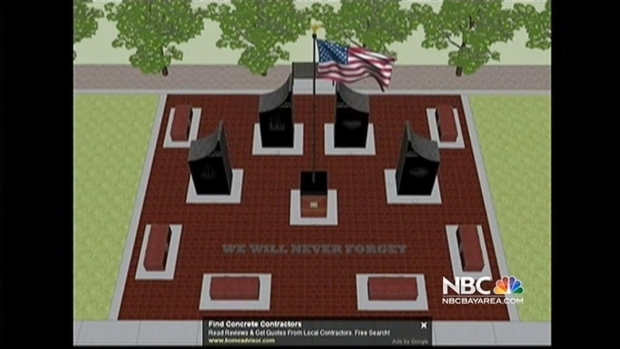 Officials hope to break ground next summer and have the memorial up by next year's ceremony. To donate to the Hayward 9/11 memorial visit www.Hayward911Memorial.com. NBC Bay Area's Stephanie Chuang and Nannette Miranda contributed to this report.